Waterborne formula paint (as opposed to solvent-based). Available in white, yellow, red, and blue. Can be applied to asphalt, concrete, brick-paved areas, and more. For paint that dries quickly, looks great, and complies with state Department of Transportation (DOT) rules, try our line of DOT Specification Traffic Paint. Transline’s DOT-regulation paint is ideal for striping crosswalks, parking lots, streets, warehouses, and more. You can rely on our paint for crisp, clear, and clean lines, even in areas with heavy foot and vehicular traffic. Traffic paint can also be mixed with glass beads to increase the visibility and reflectivity of your newly-applied markings. Our paint is suitable for both commercial and government property. 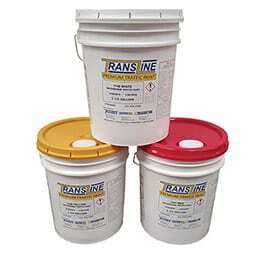 DOT Specification traffic paint comes in 5 gallon pails. We also offer 55 gallon drums and truckloads quantities. One gallon of product is usually enough to paint 320 linear feet of 4″ lines at 15 mil thickness. Please note that this page specifically refers to paint approved by the Florida Department of Transportation. Paint that complies with DOT regulations for other states can be supplied upon request. At 77°F and 15 mils wet film thickness, DOT Specification paint will dry in approximately 8-10 minutes. For best results, allow paint to dry for a full two hours before exposing to traffic. Do not apply when the ambient temperature of the application site is below 50°F and/or the relative humidity exceeds 85%. Paint should be thoroughly stirred and mixed prior to usage. Always dispose of any excess paint and empty containers in a safe, environmentally-friendly manner. Florida Transcor stocks Traffic Paint approved by the Florida Department of Transportation. Other State DOT paint may be ordered upon request.